Maurizio Sarri believes Ruben Loftus-Cheek must improve defensively after the Chelsea midfielder capitalised on a rare start by scoring a hat-trick against BATE Borisov on Thursday. 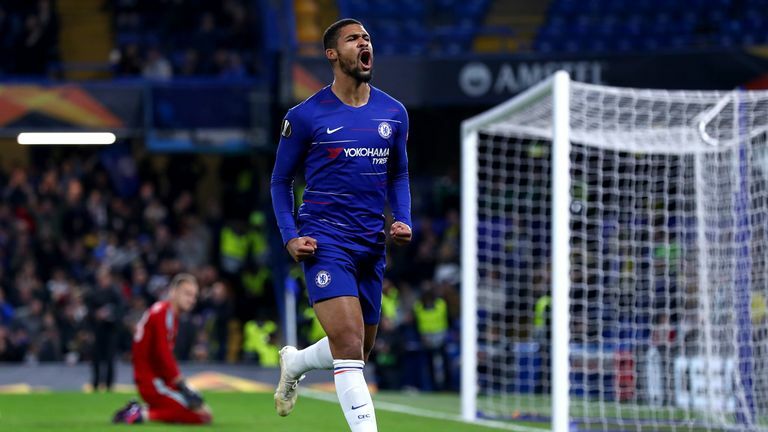 Loftus-Cheek inspired Chelsea to a 3-1 Europa League win at Stamford Bridge, scoring twice in the opening eight minutes before completing a surprise treble in the second half. It was just Loftus-Cheek's second start of the season as head coach Sarri made eight changes to the side that drew 2-2 with Manchester United on the weekend. Chelsea head to Burnley on Sunday, and Sarri admits he has a midfield headache with the improving Loftus-Cheek yet to start in the Premier League. "He played very well," Sarri said. "I think in the beginning of the season, I thought he was really a very good player. Now I think the same, but maybe he has also adapted to my football. "He is improving. He needs to improve defensively, but not only Loftus. At this moment we have four midfielders for two positions. Three of them with the same characteristics. Only [N'Golo] Kante is a defensive midfielder. It's very difficult for me to put in the starting XI two so offensive midfielders at the same time. "I hope to be able to do it in the future. But I need the co-operation of the players, and for them to work on their defensive phase." When asked about his midfield predicament, Sarri simply replied: "I like very much this kind of problem." Jorginho and Kante have played every minute of Chelsea's Premier League campaign to date, with Cesc Fabregas yet to feature in the league, while Mateo Kovacic has started six of their nine domestic games so far. Ross Barkley and Loftus-Cheek have been pushing to oust Kovacic from the attacking-midfield role, and Sarri once again stressed that a defensive improvement is needed from all as he considers his options. Sarri added: "I have a little problem. I have to put only 11 players in the starting XI, and I have 28 players. I have this problem and I don't know how to solve it. I can ask to play with 15, 16. "I have a tactical problem with the midfielders. We need to work and they have to improve in the defensive phase."